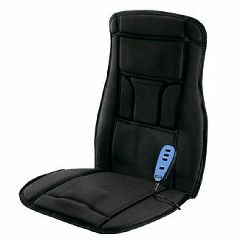 Body Benefits Heated Massaging Back System has 4 powerful massage motors provide soothing relief to upper back, lumbar region and thighs. Heat therapy allows you to relax your muscles. Easy-to-use remote hand control. Strapping system fastens to most chairs. Home adapter included.